Charlie Clouser ventures into the public, again! One of the longest running NIN fan pages on the net, Matt Brink's award winning Painful Convictions is undergoing a domain name change, due to some unfortunately asinine circumstances surrounding the ownership of the original domain, 9inchnails.com. Please update your links to reflect the new domain, 9inchnails.info, because if we can't return ownership of 9inchnails.com to Matt before February, that will be the only way to access the site. If you've any suggestions or prior experience in regards to domain name disputes, or are interested in helping support Matt's site, drop him an e-mail and introduce yourself. VH1 ran a weekend-long special dedicated to musical events, products and people that are "Too Hot For TV." The video for Closer was ranked the 14th "Too Hot for TV" video out there. The Closer video has been released by Nine Inch Nails on 1997's Closure 2 video set. Metal Hammer magazine has reported that the long-awaited Tapeworm project has finally entered the studio to begin recording thier debut album. The brief article can be read here. The article also shows the picture of Maynard James Keenan, Trent Reznor and others that popped up on nin.com a few weeks ago. A fall release for the album has been rumoured. MTV Recently aired a show listing the most controversial videos of all time. Nine Inch Nails video for Closer came in at number four. There is also commentary by Trent Reznor on the video. MTV is repeating the program Mon 4/15 @ 6:30 p.m., Fri 4/26 @ 12:30 a.m., and Sat. 4/27 @ 12:00 am. Thanks lshultz, Xelarez, Not6. If you live in Australia, or atleast get channel [v], you're going to be able to see NIN on T.V., yet again, on an hour long special that will cover the Fragility 2.0 tour, and have an interview with Trent and the rest of the band about the tour and the making of the film. For more information you can visit channelv.com.au. Click on "Shows" and then "Heavy Shift" and you'll see a picture of Trent. The show airs Monday at 9pm EST on channel [v]. Thanks to Kris for sending in the information. Apple.com is currently running aa new, five-page exclusive interview with Charlie Clouser - including detailed background info on what led him into Nine Inch Nails, the remix work he's done for NIN, Bowie and others, and the new projects he is currently co-producing, engineering and co-songwriting in: Revenge of the Triads and Page Hamilton's new post-Helmet project. He also offers his personal tips and secrets for people interested in getting into sound or engineering. It looks to be a very interesting set of write-ups, so check it out! Sick Among The Pure has just released their April edition which includes some more great poetry from RK Finch, a review of The Art of Self Destruction, an in depth walk through of all of the hidden AATCHB DVD secrets (for those of you who haven't been able to get to all of the secret stuff), and a whole lot more. Oh, and if that wasn't enough, the site has gotten a facelift and looks really great! Thanks to Drew for sending in this information. 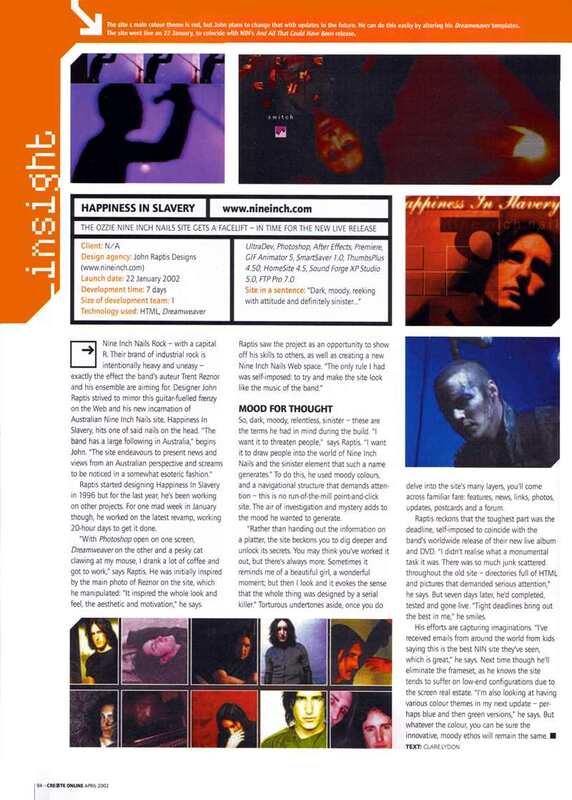 The March 2002 Chart Magazine (www.chartattack.com) features Alanis Morissette on the cover, but within it you can find a two page article on Trent Reznor, Nine Inch Nails, and the AATCHB DVD. Here's a little snippet from the magazine. "Of course, we've still got our quota of forlorn rock dudes. In this issue we get down in it with Trent Reznor of Nine Inch Nails fame. We're sure you all know Trent from such happy-feel-good anthems as "Head Like A Hole" and "Happiness In Slavery." As it turns out, he's not that creepy after all. Sure he's got this real gallow's humour, but he isn't that weird. Well, maybe he is. You'll just have to read it and decide for yourself." You can pick up an issue of the magazine here. Thanks to Elizabeth for sending the news in. Charlie Clouser will be commenting on music technology and its relationship to Apple Computers at one of Apple's retail stores on Tuesday, April 9 at 7 p.m. in the Glendale Galleria (CA). Check TRF News section for more info. Thanks to Morpheus_TechnoPagan. Telefon Tel Aviv will be touring Germany and Italy in May. Check the 'Shows' section at the official Hefty Records website. As you may remember from previous updates TTA has worked with APC and NIN.